Written by Mariana Caplan, Ph.D.
From the tales of excess in American Ashrams to the horror of mass murder in Jonestown, tales of people who’ve been hoodwinked and hurt while looking for enlightenment litter the modern landscape. I’ve always been more than a little fascinated with stories from survivors and outside authorities about the sordid realities inside the seemingly purely spiritual environments. Mariana Caplan’s Eyes Wide Open is a wonderful look at what we might encounter as our spirituality matures. Caplan is a psychologist, not a guru. From her perspective, we must deal with our psychological life as well as our spiritual, which makes plain sense. Our inner wounds of resentment, fear, and pain will not magically disappear with the application of God. As Caplan states, we "must be willing to suffer our own darkness if we truly aspire to know the deeper spiritual potentialities that exist within us (p. 20).” The good news is that, if we do the work and heal the wounds, "future suffering is prevented through intensive self-study and practice that allows us to become aware of our unconscious processes and to intercept them (p. 102).” I found Caplan’s attitude about the ego refreshing and far more practical that that found in many spiritual systems. Instead of denying, waging war against, or squelching the egos, Caplan advises a non-essentialist view in which the ego exists without needing an external reference. It is her writing about a spiritual teacher that I found most rewarding. Caplan believes that it is entirely possible to spiritually grow without one. Moreover, there are relatively few people who are psychologically and emotionally healthy enough to lead others. She notes that chasing after external gratification doesn't allow one to fully develop one's own talent or spiritual connection. There is no One True Way or Teacher and to look for one is misleading. This is not a light read, nor an easy one, although the writing is clear and well-organized. There are many concepts here, as well as the potential for those moments of awakening accompanied by chagrin at poorly-made decisions and a sense of ‘that’s what I did wrong!’ Spirituality, like psychological health, is hard work to create and maintain. 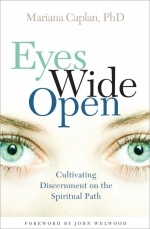 In my opinion, Eyes Wide Open is necessary reading for every teacher and priest/ess.